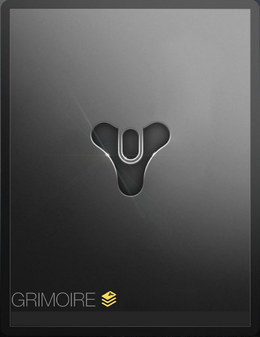 The Grimoire is a database within Destiny. Entries were unlocked through playing the game in the form of "Grimoire Cards." The list of Grimoire entries is sorted into six main categories—Guardian, Inventory, Allies, Enemies, Places, and Activities. Each of these categories has a number of sub-categories. Grimoire cards were earned through various ways, such as completing a Story mission or Strike, playing a match on a Crucible map, reviving a Dead Ghost, discovering a Calcified Fragment, or finding a Dormant SIVA Cluster. They were also unlocked by earning kills with specific weapon types; each rank allowed upgrading that weapon type to be faster. Last but not least was a series of redeemable codes which could be inputted into Bungie's website that unlocked cards. Grimoire entries do not feature in Destiny 2, as the story is instead told in-game. Following the release of Destiny 2, the Grimoire feature was removed from the Bungie website and the Destiny app. Cards and their corresponding bonuses are still unlocked in-game but they can not be viewed. Cover of the Grimoire, from the Android Companion App. A Grimoire is a textbook of magic used by spellcasters.